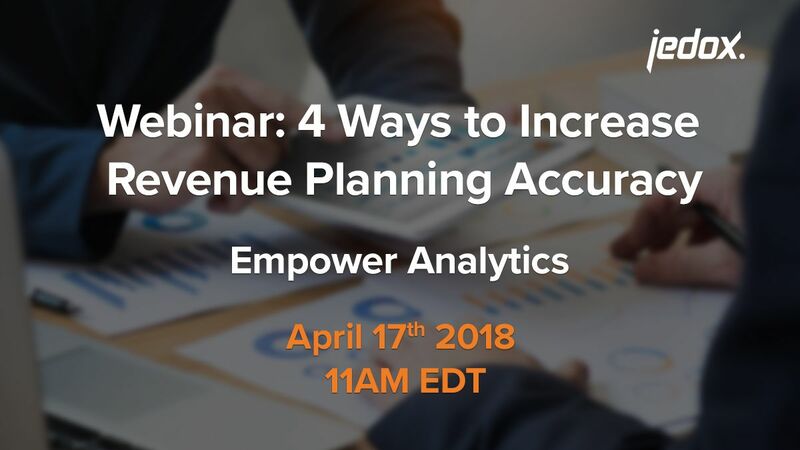 WEBINAR: "4 Ways to Increase Revenue Planning Accuracy"
In planning and forecasting, setting top-line revenue targets is often the first and most critical step to get correct. In this webinar, we will explore various revenue models and best practices for arriving at accurate and timely revenue forecasts. Leveraging sales pipeline data to drive a plan or forecast with new and changing assumptions for valuing sales pipeline figures. Utilizing large datasets of SKU level volume, sales price, and COGS values to review detailed actuals and build a baseline for monthly forecasts. Visualize the various ways we can use actuals or previously built budgets to update and review both top-down and bottoms up revenue forecasts. Version Control: Using version management, we allow users to quickly compare and contrast budget versions to determine which numbers make the most sense. Showcase Jedox’s ability to import and consolidate revenue and supporting data from separate systems, allowing you to refresh your data on demand. Sign up today and find out how you can simplify your planning processes! Jedox simplifies planning, analysis, and reporting with one unified and cloud-based software suite. Jedox empowers decision makers and business users across all departments, helping them work smarter, streamline business collaboration, and make insight-based decisions with confidence. Around 2,500 organizations in over 140 countries use Jedox for real-time planning in the cloud, on the web, and on any device. Founded in 2002, Jedox is a leading provider of Enterprise Performance Management software that incorporates business intelligence in one integrated solution. Locations on four continents and a worldwide network of over 250 business partners underline Jedox’s international orientation. Independent analysts recognize Jedox for its leading enterprise planning solutions. For the last 3 years in a row, users ranked Jedox Software as a Leading Enterprise Planning and Business Intelligence tool in the Howard Dresner Market Studies and BARC Planning Surveys.